Is Netflix Coming to PS3 and Wii? Sony's officially denied it in the past, but a survey is being conducted to sniff out the public's interest in streaming movies and TV shows to their console of choice. Apparently the service on PS3 would require a one-time purchase of a $9.99 "Netflix Instant Streaming Disc" that must be inserted to stream video, but would be free otherwise. The survey asks for your favorite console, and then asks if you'd be interested in the service for it; presumably the Wii would be eligible as well. We've got to consider this a rumor as of now: Nobody has officially confirmed this, and our brothers from other mothers at Kotaku report that streaming on the Wii, at least, would be a "long time off." Here's the complete survey. Imagine that, as an added benefit to DVDs by mail, Netflix offers its subscribers the ability to watch movies & TV episodes instantly on their TV via their PS3, choosing from a library of over 12,000 choices. There are no advertisements or trailers and movies start in as little as 30 seconds. You can fast-forward, rewind, and pause or watch again. 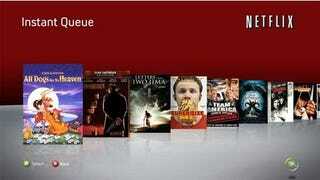 The movies & TV episodes you watch instantly are included in your Netflix membership for no additional service fee. * 1 Unlimited: Rent as many DVDs as you want, 1 DVD out at a time, plus an unlimited number of movies & TV episodes that you can watch instantly on your TV via your PS3. $8.99 per month. * 2 Unlimited: Rent as many DVDs as you want, 2 DVDs out at a time, plus an unlimited number of movies & TV episodes that you can watch instantly on your TV via your PS3. $13.99 per month. * 3 Unlimited: Rent as many DVDs as you want, 3 DVDs out at a time, plus an unlimited number of movies & TV episodes that you can watch instantly on your TV via your PS3. $16.99 per month.